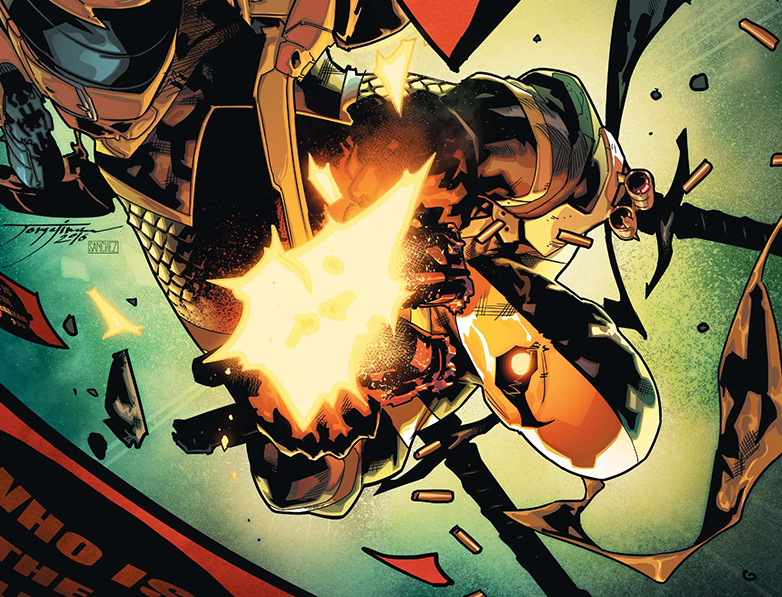 Deathstroke Annual #2 Review – AiPT! It’s Deathstroke vs. The Balkan (according to the cover anyway). Is it good? When the son of a powerful drug warlord is assassinated by a mysterious costumed hitman known only as The Balkan, Deathstroke is hired by his family to take revenge! But who is The Balkan? And what is his endgame? Find out in a stunning annual you won’t want to miss! Deathstroke gets an annual story (which takes place after issue #20) where he’s off to Rhapastan to do some death dealing justice. Sounds like a mission that only he could go on. Phil Hester has written a good story from beginning to end here that could stand on its own even if it were a movie. We follow Deathstroke into the deserts of the Middle East; along the way he befriends a boy – and tries to give him some hope of exiting this god forsaken place – and must even take on some poison spewing baddies too. The Balkan adds a complexity to the story that involves a big surprise and Deathstroke is even brought back to the loss of his son along the way too. The narrative never tires and there’s a surprising/sad twist of an ending too. This ending connects with the sad nature of the Middle East today which reminds us the lives Deathstroke takes in this story aren’t meaningless. They’re lost already. The art by Mirko Colak is gritty and at times reminded me of Mitch Gerad’s work on Sheriff of Babylon. It’s gory when it needs to be and incredibly strong when it comes to environments and people. That’s important when you’re dealing with a hero who really doesn’t have superpowers. When cars flip from explosions, swords enter bodies, and chains choke necks you feel it. Also, can I just say Deathstroke looks great in a poncho. The only gripe I have is how Deathstroke comes away from it all. Avoiding spoilers here, but let’s just say it’s a rather foolish last ditch effort that makes this usually master tactician look like a beginner. Like a good action/war movie this comic packs a wallop. It hits all the right notes and delivers an action packed and page turning story.